Dar Lighting Adriatic 5 light ceiling pendant features a circular design ceiling plate with cable holding an oval polished chrome cage encasing strings of myriad glass crystals beads and droppers and finish with a large, centrally positioned crystal drop. 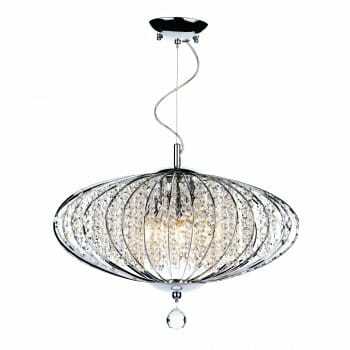 The product code for this Dar ceiling pendant is ADR0550. This spectacular design will be a stunning centre piece for modern decor and provides an array of sparkling illumination, also suitable for use with a dimmer switch to create atmospheric lighting. Height adjustable at the point of installation. The Dar lighting Adriatic collection includes a 3 light ceiling pendant which can be viewed on our website.